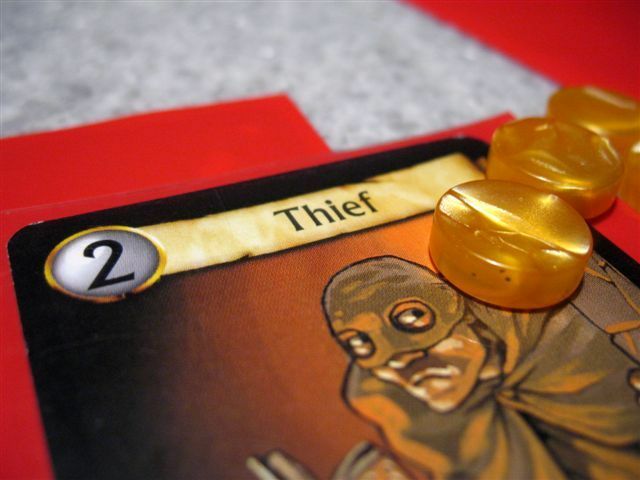 Boardgames in the News: Asmodee on the March Again? Last summer we speculated how long it would be before Asmodee turned their attention to F2Z Entertainment with their enticing range of games including Pandemic and Carcassonne. Well, last week, Asmodee announced that it has entered into exclusive discussions to acquire F2Z Entertainment with closure of the acquisition expected to take place in the coming months. Who will be next, Rio Grande Games perhaps? This entry was posted in News and tagged Carcassonne, Dobble, Pandemic, The Settlers of Catan on July 27, 2016 by nannyGOAT. With Red, Magenta and Blue moaning about work and only Burgundy waiting for real food, when Pine rolled up we began straight away with our “Feature Game”, the light filler, Las Vegas. This is a very simple dice game, but actually quite a lot of fun. 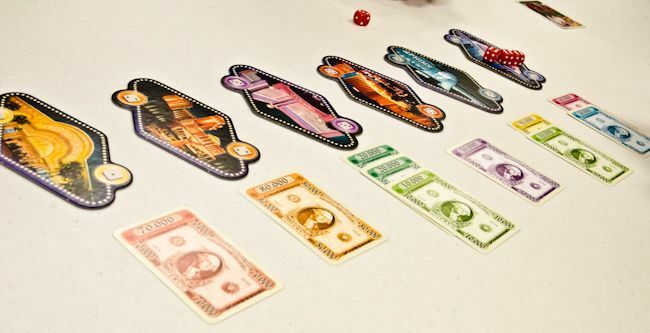 On their turn, each player begins by rolling their dice, then assigning some of them to one of the six casinos. Each casino is numbered one to six and has a jackpot of over $50,000, drawn at random from a deck of money. Thus, each jackpot could be anything from $50,000 to $180,000 and comprise one to five notes. On their turn, players must use all the dice of one number to bet on the casino of that number. Once everyone has placed all their dice the player who placed the most dice on a casino takes the highest value currency card. The player with the most money after four rounds is the winner. 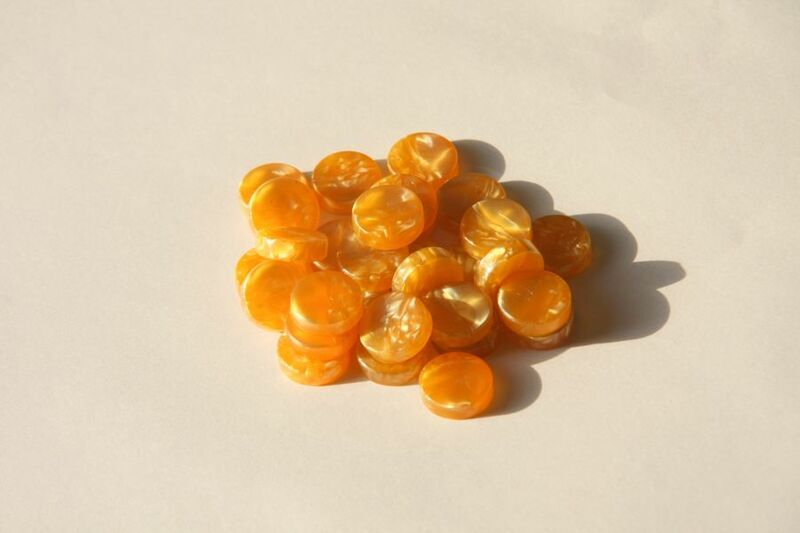 The snag is that before any money is handed out, any dice leading to a draw are removed. It is this rule that makes the game interesting, raising the decisions above the trivial and, in our view, making it a better and much more fun game than Qwixx which we played two weeks ago. Although the game only plays five (without the Boulevard expansion), Blue had added an extra set of purple dice just in case, so when Green walked in just before the game started, he was able to join in. In the early part of the round, each player has to decide whether to conserve dice or whether to make a statement and go in big. 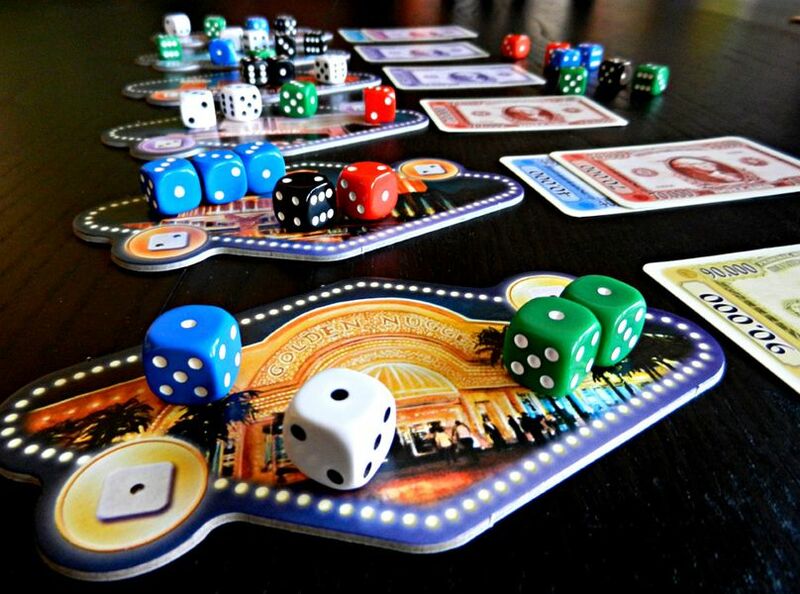 As the round progresses, players must choose where to place their bets then try to finesse their position before being forced to place their last die or dice based solely on chance. 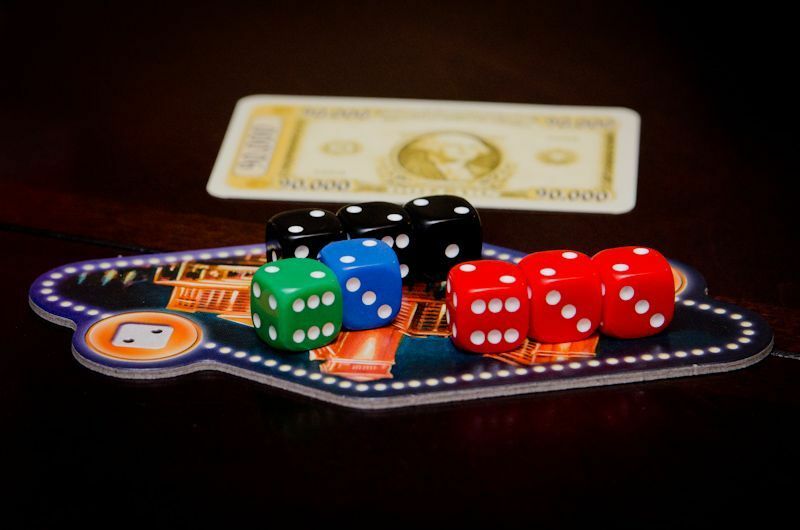 The factors that go into the decision include the value of the rewards available, the current position and the number of notes as well as the probabilities of other players interfering. The probabilities are non-trivial too, because rolling multiples can change the number of dice available for the next roll. In the first round, everyone made the same mistake and committed too many dice too early, but after that, we all got the hang of it and the game was quite close. Players keep their winnings hidden, but since everyone had had rounds with lean pickings as well as generous ones, we all felt we were in with a chance. The last round began with it all to play for and everyone taking it in turns to roll lots of sixes. At the end of the game, we announced our totals in turn: Green finished with $260,000, Pine with $250,000, Burgundy and Blue tied with £270,000, but Magenta just pipped them with $280,000. Red, however, took longer to count up her cash for good reason and finished well clear with $360,000. With the arrival of Black and Purple, we decided to split into two groups. 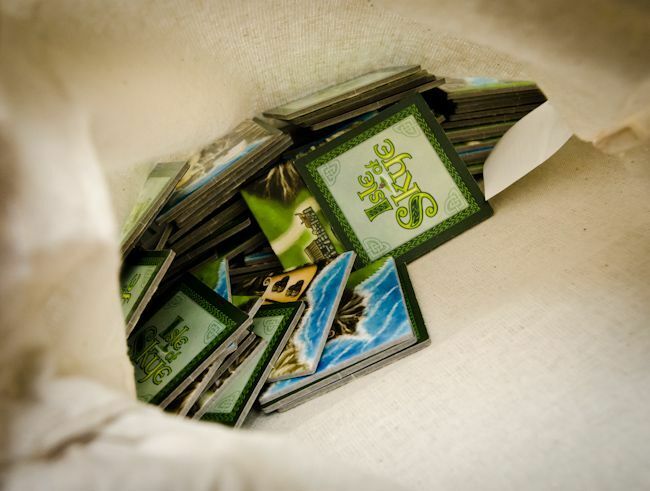 The only game that everyone really wanted to play was Isle of Sky: From Chieftain to King, so since we only had the one copy, five went for that leaving the three others to find something else to play. 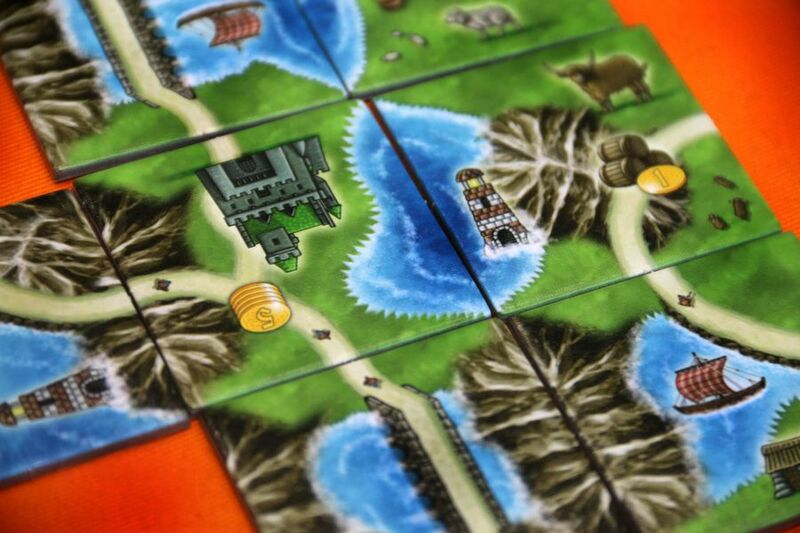 Isle of Skye is a tile laying game where players play a sort of solitaire Carcassonne, bidding for tiles and scoring a the end of each of the six rounds. We’ve only played the game once on a Tuesday in November, but it has proven to be very popular at other local meetings too, so everyone playing had played before and the game was quick to get going. Burgundy had played it a few times and, unusually, generally seems to struggle with this game. This time he started well, and took the lead from the start, unfortunately however, he struggled to pick up scrolls, so suffered in the end game scoring. One of the peculiarities of this game is the fact that from round three, at the start of the round players get one extra gold coin per player in front of them on the score track, increasing to four extra coins by the final round. This really adds up, and a player who takes advantage of this bonus can have a large impact on the score track. Black made hay on the bonus sitting at the back for most of the game, however, he failed to use the gold and finished with fifty-one unspent coins. Between Burgundy at the front and Black at the rear, Purple, Pine and Magenta were jostling for position. Without sheep and cattle featuring strongly in the scoring tiles this time, Pine felt he would struggle, but he made a surge for the front in the final scoring. Magenta who had spent a lot of the game at the back of the pack with Black gradually moved through the field in the later rounds and finished four ahead of Burgundy in joint first with Pine on sixty-six, with Pine taking it on the tie-breaker. Meanwhile, Blue, Green and Red were playing an aggressive game of Citadels. This is a slightly older, role selection game. Everyone starts with a hand of district cards and the start player, “The King”, also has a hand of eight Character cards. The Character cards are shuffled and one is placed face down blind. The King can then choose one Character card and pass the rest on to the next player. The cards are drafted in this way until (in the three player game) everyone has two and the remaining card joins the first card, face down to one side. Thus, each player has two Character cards and each Character card has a number and a special ability. “The King” then calls the characters in turn, by number and name, and the player who has that card then immediately carries out their turn. A turn consists of either taking money or drawing two cards from the deck, then paying the monetary cost to build one of the district cards from their hand. The game ends at the end of the round in which a player builds his eighth district card. 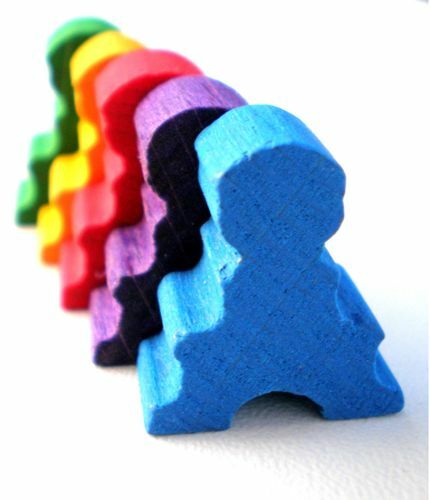 The scores are then added up with players receiving points for their buildings equalling the total cost to build them, plus bonuses for being the first player to build eight district cards, bonuses for having at least one district in each of the five colours and for achieving a total of eight buildings before the game ends. We played with some of the Characters from the Dark City expansion so “The Witch” replaced “The Assassin”, “The Tax Collector” replaced “The Thief” and “The Navigator” replaced “The Architect”. We also chose a random selection of the valuable “purple buildings”, a factor that turned out to be quite critical to the game play in the end. Blue took an early lead, building a couple of “purple buildings”, in particular, the very annoying Ball Room. The “purple buildings are expensive to build, but generally come with some sort of special power, in the case of the Ball Room, if the owner is also The King, every player must say “Thanks, Your Excellency” before taking their turn otherwise it is forfeit. Without “The Thief” in play, Blue was able to let her money build up and was hoping to build the Library, when Red played “The Magician” and swapped hands with her. Unimpressed, in the next round Blue played the same trick, giving Red the apparently rather useless Armory in exchange. To make sure Red didn’t nick it back, Blue built the Library quickly, her third purple building giving her a healthy lead though she, like Green was struggling to get the blue cards she wanted to pick up the bonus for having a building of each colour. Green meanwhile was having other problems of his own, compounded by the fact that he forgot to be obsequious and therefore lost a turn. 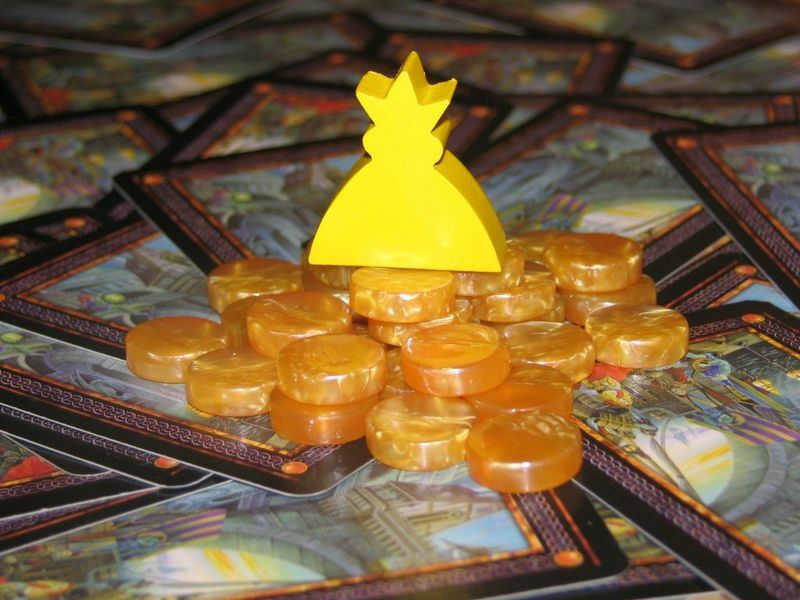 Citadels is one of those rare games that plays a wide player count, nominally from two to eight players. However, while there is a consensus that it does not play all numbers equally well, the on-line jury is still out as to where its “sweet spot” is. In fact, some people appear to think it is best with small numbers, while others prefer it with more players. 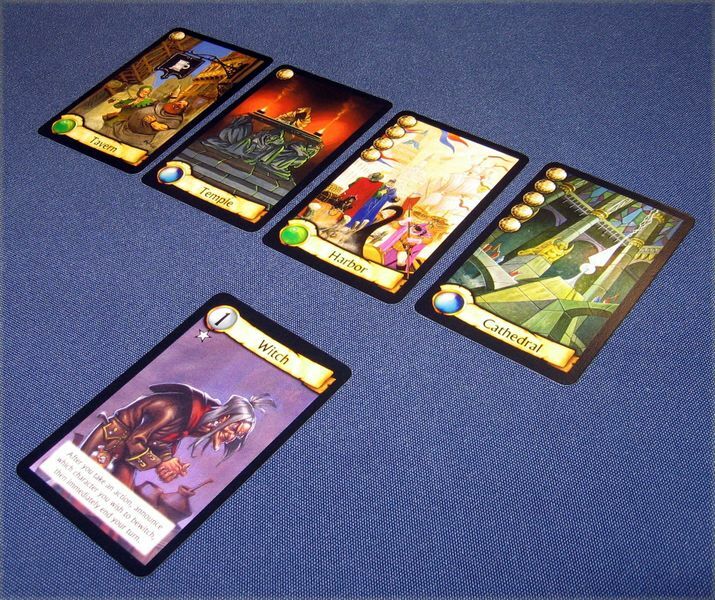 We’ve played Citadels a few times on a Tuesday, a couple of times with just two players, but also with five. Blue and Green had been involved on each occasion and Blue in particular had quite enjoyed the game with just two players, but had hated it with five. With two she felt it was a game where players could really try to get inside the head of their opponent whereas with five she felt it was horribly chaotic and difficult to follow what was going on. Knowing this, Green had thought three might have some of the features of the head-to-head game while adding more dimension to the game play and, despite losing, Blue agreed, that three was an excellent number of players for this game. 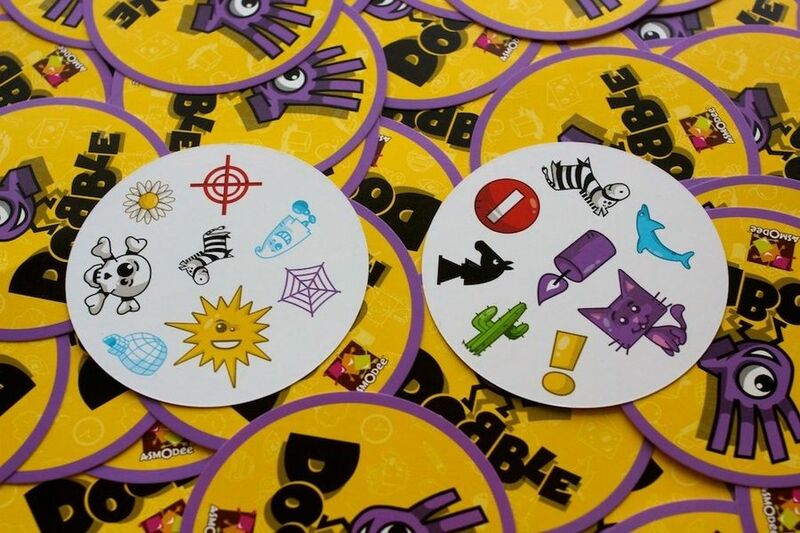 While Citadels was finishing, the other players filled the time with a couple of rounds of an old favourite, Dobble. The first round was a warm up which Magenta ducked out of as she has a bit of a reputation as the “Dobble Queen”. This was played with the conventional “Towering Inferno” variant, where players call out matches and grab cards from the central pile. In the second round, Magenta joined in so “The Poisoned Gift” variant was chosen, otherwise known as “Gang up on Magenta”. In this version, instead of grabbing cards from the middle for yourself, you match them and stick them on someone else’s pile (usually Magenta’s), with the aim to finish with as few cards as possible. Everyone accordingly rained cards down on Magenta who duly lost with Black winning by one from Pine and Burgundy. Time was ticking on, so we decided to play a quick game of Saboteur. This is a team game where you don’t know who your team mates are. With eight players, there is a team of five or six Dwarves trying to find the treasure, and two or three Saboteurs, trying to stop them. 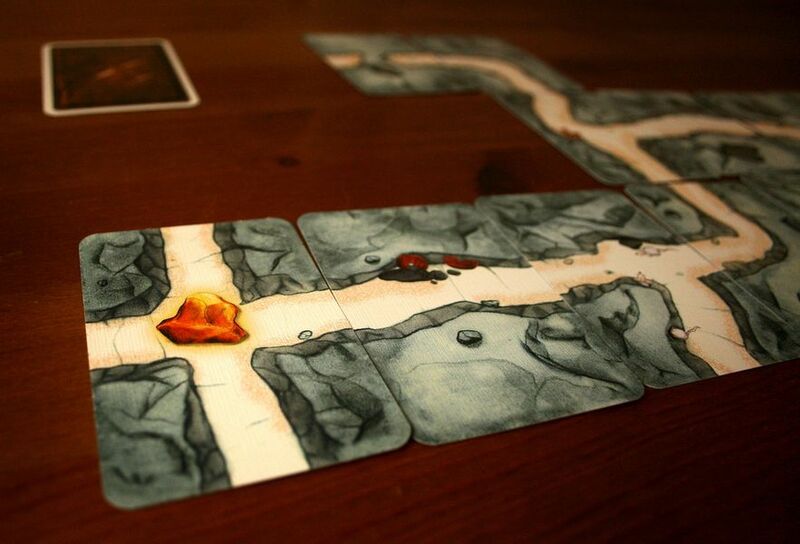 On their turn, the active player can play a tunnel card to progress towards the three possible treasure locations, play an action card or discard a card face down (a very Saboteur-like action). 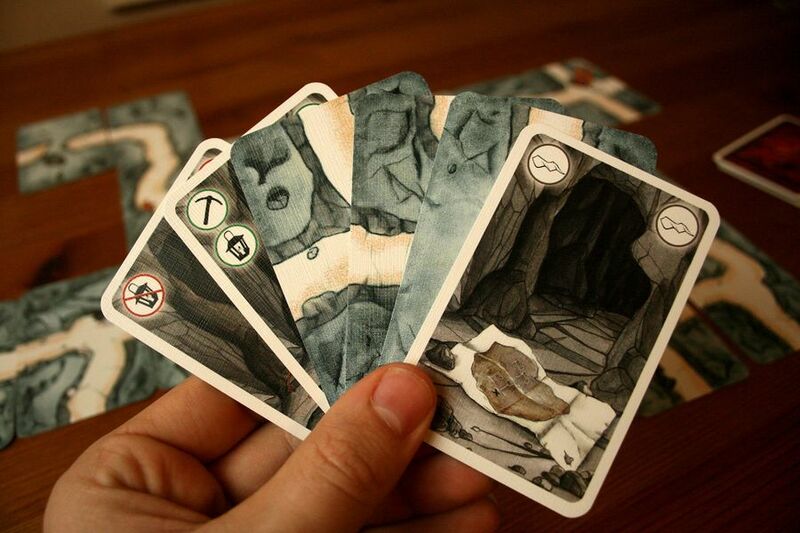 The action cards come in a variety of flavours: broken tool cards that are played in front of other players and prevent them from laying tunnel cards; tool cards than cancel out broken tool cards; map cards that allow players to look at one of the possible treasure locations to see whether it contains the gold or not, as well as rockfall cards that allow players to remove tunnel cards that have already been placed. The game is supposed to consist of three rounds with the winning team taking prize cards, however, last time we played, we decided that the addition of prizes meant the game inevitably outstayed its welcome. We felt it would be better to play one round, and if we wanted, play a second, but treat them as separate games, which is exactly what happened this time. In the first “game”, Magenta and Purple claimed the gold was at one side, while Black and Blue claimed it was in the middle – clearly we had two of our Saboteurs, but which pair looked guilty? After a couple of rounds, Magenta showed her true colours and played a broken tool card in a Saboteur-like manner and she and Purple were promptly stomped on. Suitably, after everyone had doubted him for so long, Black was the one to finally find the gold. Green had had enough and headed off, but Pine, Red and Magenta agreed to stay for one more go. This time Red decided to have a go at Pine from the very start – maybe it was the pointiness of his ears or the way he carried his pick axe, but she claimed he was definitely a Saboteur. Everyone else was less quick to condemn, and before long it became clear that it was Red and Purple (again!) who were guilty and, although it was closer, the Dwarves still got to the gold first. With people leaving, there was just time for Black, Purple, Burgundy and Blue to squeeze in a quick game of The Game. We started dreadfully, and two piles were very quickly closed off. Somehow we managed to keep going though and, despite an appalling run of luck and a couple of us making dodgy decisions, Black was eventually able to draw the last card from the deck. Playing just one card at a time made things a little easier, but we still had over twenty cards to get rid of. Sadly, it was not to be; the poor start had done its damage and we finished with a total of eleven cards in hand. Learning Outcome: When a game is *that* popular, bring it again! 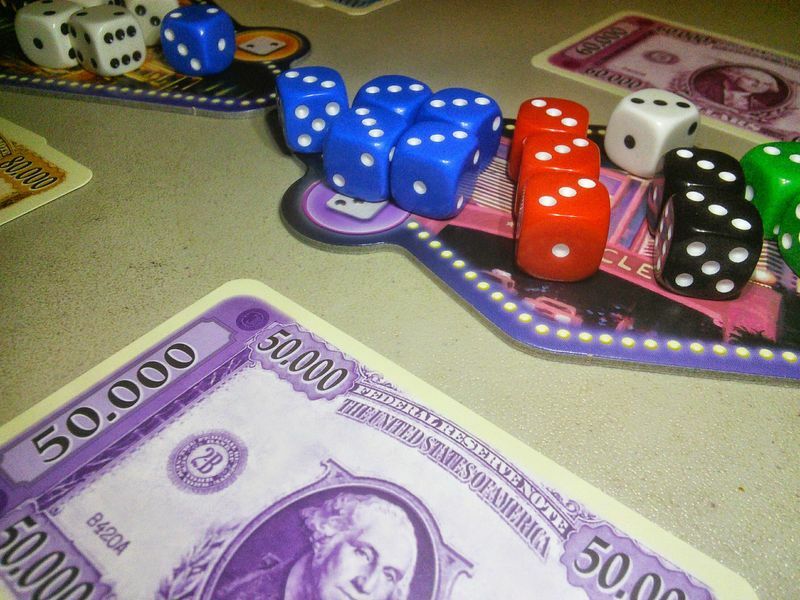 This entry was posted in Games Night and tagged Citadels, Citadels: The Dark City, Dobble, Isle of Skye: From Chieftain to King, Las Vegas, Las Vegas Boulevard, Qwixx, Saboteur, The Game on January 25, 2016 by nannyGOAT. 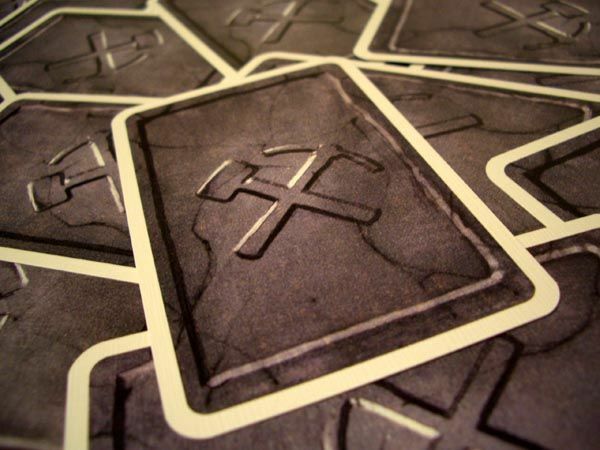 A year ago, following their acquisition of Esdevium Games, Libellud, Days of Wonder, Fantasy Flight games, Ystari Games, Asterion Press and Pearl Games we discussed the sudden expansion of the hitherto small French games company, Asmodée. More recently, following a new contract with Queen Games for exclusive distribution rights in the USA and the ensuing restructuring of its three main US operations, Days of Wonder, Fantasy Flight games and Asmodee Editions to form a single entity, Asmodee North America, we wondered whether this growing monopoly would lead to price rises. This concern arose, in particular, as from January 2016, distribution would be restricted to “speciality retailers” that have agreed to Asmodee North America’s “Speciality Retail Policy” including the prohibition of online sales. Asmodee followed the initial press release with a second press release clarifying their position, in the form of a series of questions with answers. This did not completely allay many of the concerns, however, to the specific question, “…will you institute or impose official price floors or “minimum advertised price” policies”, they responded, “No”. There has been a considerable speculation, but it seems clear from this “clarification” that although they intend to restrict “speciality retailers” to face-to-face transactions, this will not affect mass market outlets, such a Amazon, Target, or Barnes and Noble. Another way of looking at it is that the medium-sized online vendors including, CoolStuffInc and Miniature Market (who are popular with US Geeks thanks to generous discounts), will no longer be able to sell Asmodee North America products, however, players like Amazon etc. are too big to be susceptible to their bully-boy tactics. We will see what happens in the long run, but for the time being, so much for the end of 2015 press releases. With the new year, there are new take-overs, and unsurprisingly, Asmodee are at the centre once again, this time announcing that they are taking over the production of the English language edition of Catan (formerly known as “The Settlers of Catan”). Celebrating its twentieth anniversary last year, The Settlers of Catan has been translated into thirty-five languages and is reported to have sold over twenty-three million copies worldwide. As such is it one of the biggest names in the world of modern boardgames. With this acquisition from Mayfair Games, Asmodee have also announced that they will launch a subsidiary, “Catan Studio”, dedicated to the creation of content for different media for the “Catan Universe”. Catan Studio will be headed by Peter Fenlon, former CEO of Mayfair who will work with Catan GmbH and its partners on this development. With this acquisition, it brings Catan, Ticket to Ride and Star Wars: X-Wing Miniatures Game as well as the very popular card game, Dobble, all under the same roof. So, what next? Surely bringing together such a large slice of the modern gaming market makes Asmodee themselves a potential take over target. In fact, perhaps the only question is whether the likes of Hasbro will make a move before or after Asmodee make their next acquisition. Any bets on the future of Filosofia/Z-man Games with Pandemic and Carcassonne…? This entry was posted in News and tagged Carcassonne, Dobble, Pandemic, Star Wars: X-Wing Miniatures Game, The Settlers of Catan, Ticket to Ride on January 7, 2016 by nannyGOAT.